Some time ago, I went apple picking and came back with around 25kg that I bought. One part went for direct consumption, another went for apple pies and another part went for testing a recipe for Halloween (even though we don’t celebrate it in Lebanon but it got imported and I root for our traditional dress-up feast) but sweets are out of this argument. Right? 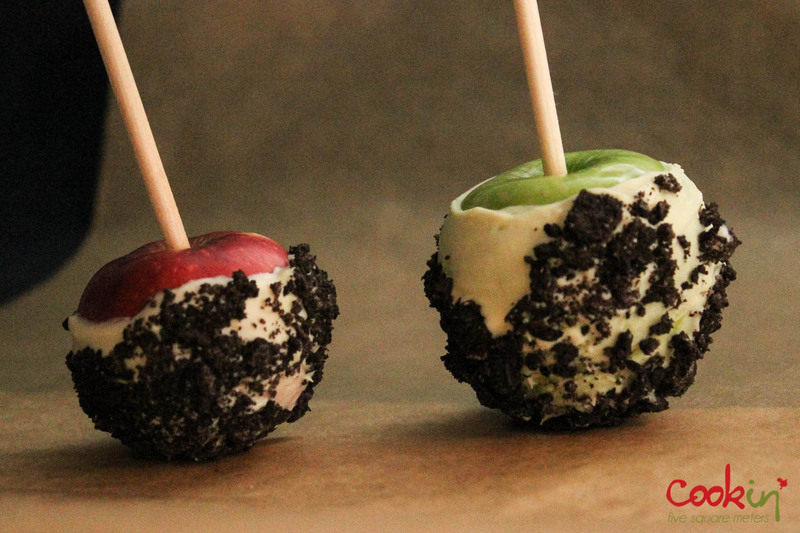 I’ve always wanted to try those red candy apples that look so delicious and painful to bite into. The first time I tried one of those was not when I was in Disneyland — I have never been to Disneyland — but I was in Souk Sabra, a street market where cleanliness, organization and hygiene are unusual terms. Don’t ask me how I dared. It was a Snow White moment. 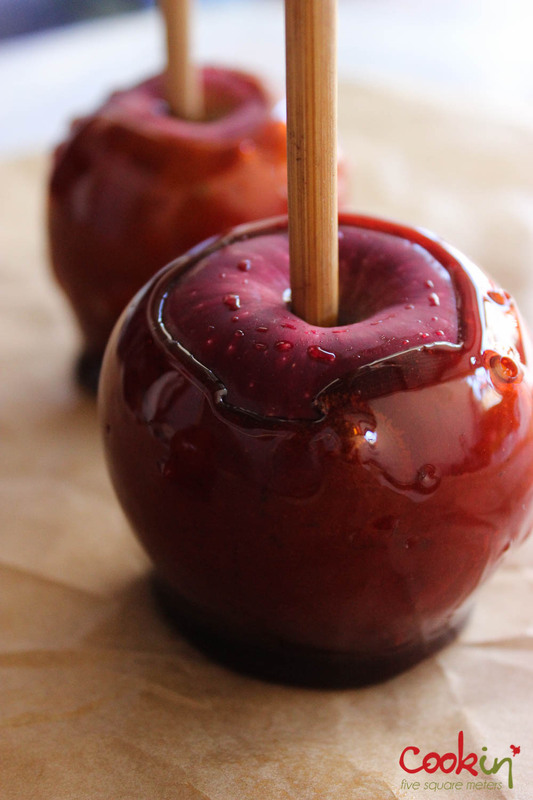 A mouthwatering shiny red apple. I bit into it and it stuck to my teeth instead of my throat. Phew, that didn’t need prince charming to be around. Back to my apples. Searching recipes, I couldn’t help but notice that all of them had corn syrup. After a brief conversation with my friend Paty, she told me that corn syrup and high fructose corn syrup are very damaging for the body because they are not processed but bypassed directly to be stored as fat. Read the labels on products you buy (syrups, sauces, sodas…) and you’ll be surprised how much is snuck into everything. You’ll never have to wonder where those love handles came from again. 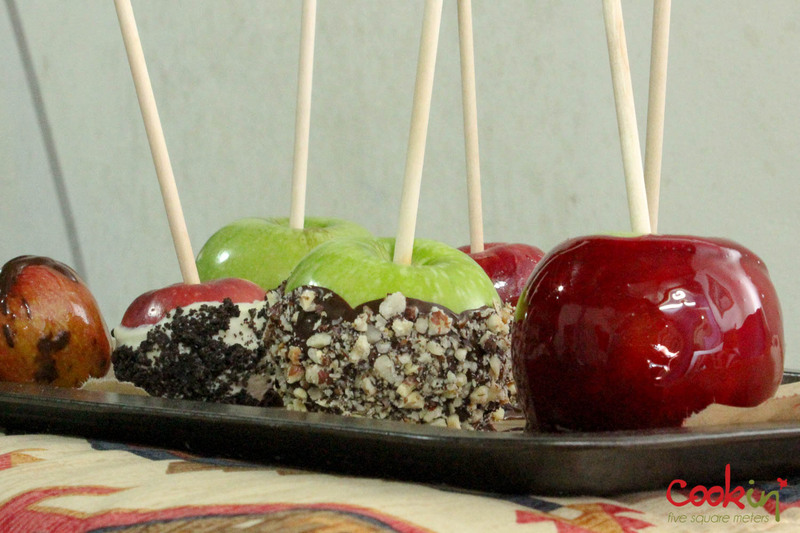 I decided to find me a recipe without corn syrup and test it to get the perfect apples. It was an extensive search. I tried it a million times before reaching a satisfying one. My family got sick of the smell of caramel on the stove. 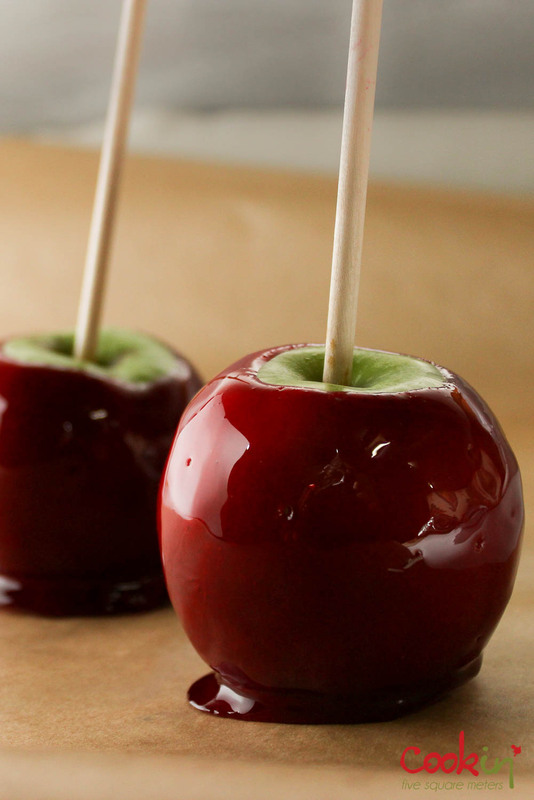 I have been researching all the time to get the perfect apple. But perfect doesn’t exist. 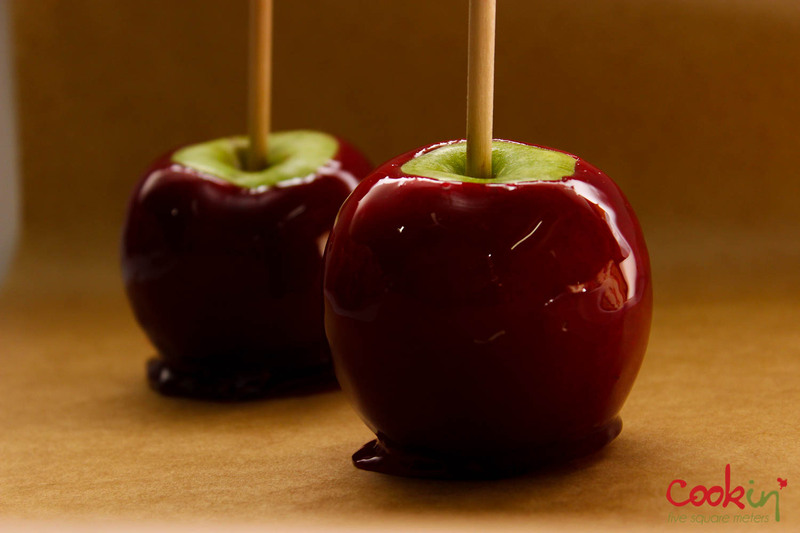 What is achievable in this case is, red candy apples with no corn syrup that should be kept away from humidity, thus should be consumed soon after preparing or stored in the refrigerator. I have to confess. I used red food coloring. But only for this recipe I allowed myself to. 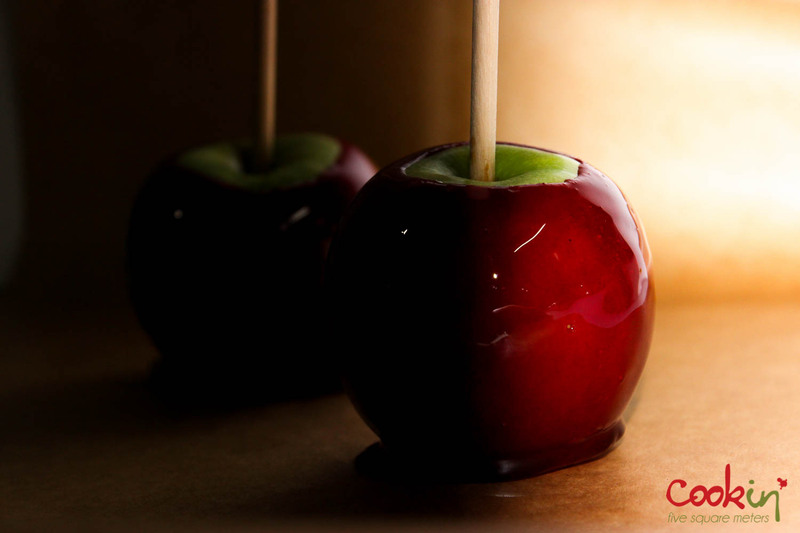 I don’t want transparent candy apples. Without going into scientific details, when melting the sugar, something is required to prevent the crystallization and keep the smooth texture. Corn syrup does that. In my case, lemon juice, vinegar or cream of tartar can be used and it worked just fine. 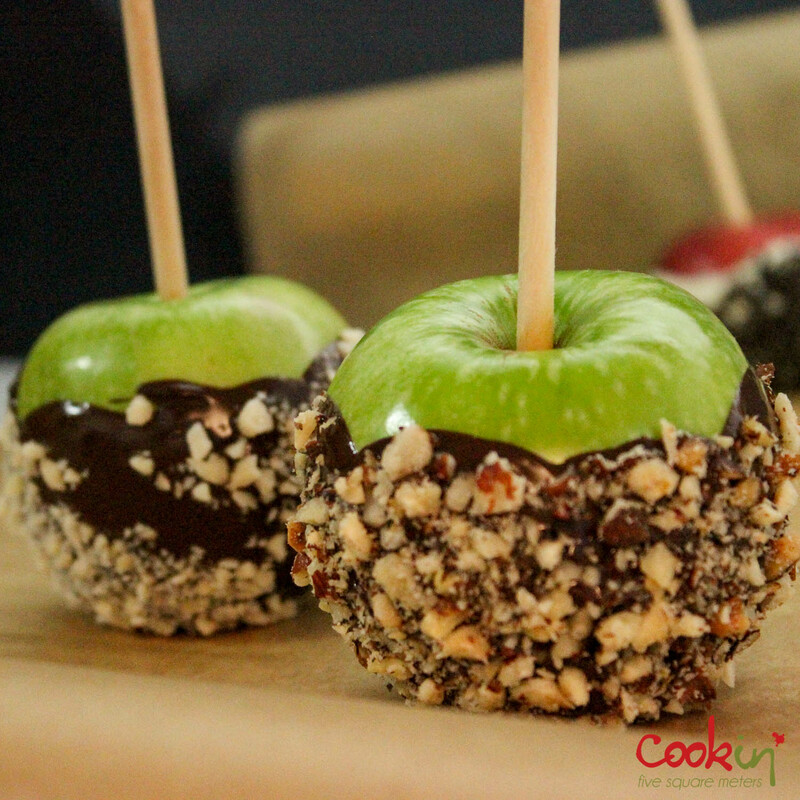 I also made gourmet chocolate apples with nuts and tried making caramel apples with the caramel sauce I had (Lazy me) but it didn’t work because it’s not the right recipe for apple coating. For the chocolate, melt it in a deep small bowl using double boiler (bain-marie) and repeat the dipping process as above. 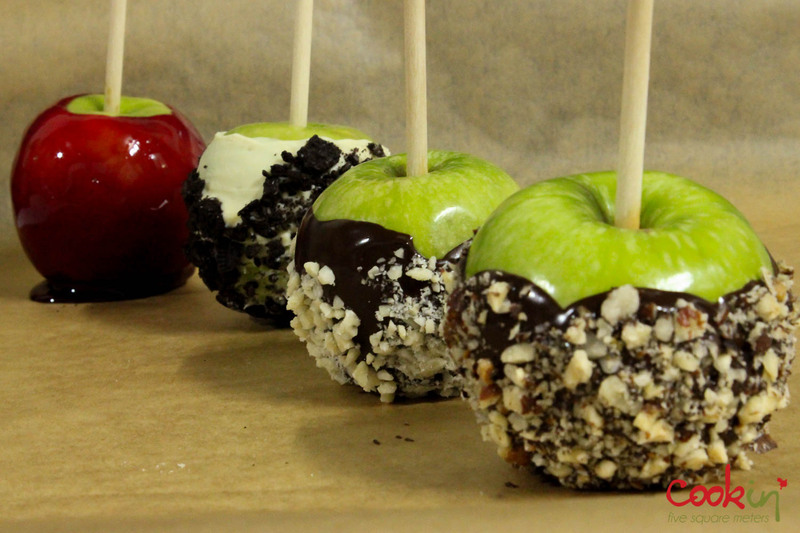 This entry was posted in Dessert, holidays, Recipe, Vegan, vegetarian and tagged apple, candy, candy apple without corn syrup, candy without thermometer, caramle apple, Chocolate, chocolate apple, granny smith, halloween, healthy, healthy candy, no corn syrup, no syrup, oreo, recipe, red apple, red apples, sugar, sugar apple, sweet apple. Bookmark the permalink. you are motivating me to give it a try! 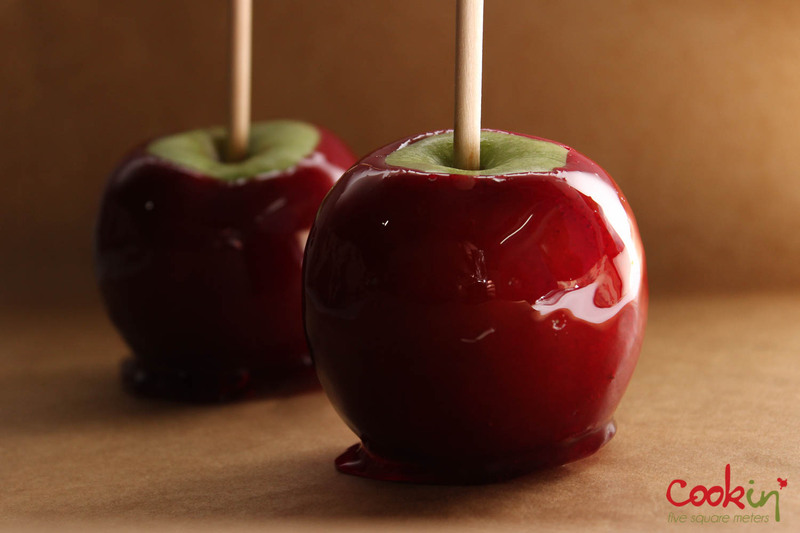 I have lived in the US most of my life, and not once did I buy a caramel apple. They sell now right now at all the supermarkets! I have to mention that I tried it and wasn’t that satisfied with the results. I think it’s a great way to reduce children’s intake of liquid sugars. No one has to tell….let them just enjoy. My gfriend is trying it soon..I’ll update the reaction.